It sounds like the punchline to a spectacularly bad joke. Despite it’s comical-sounding name however, bulging disc (aka “slipped” or protruding disc) is a serious musculoskeletal condition. Bulging discs are one of the more common causes of back pain. In fact, many people who suffer from bulging discs mightn’t even realise it. Our Caulfield physio is here to explain the cause of a bulging disc, and most importantly, how it can be treated. Read on to discover how you can rid yourself of back pain and take advantage of a special, one-time offer! 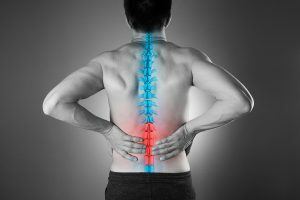 Let’s start from the beginning: what is a spinal disc? Before we explain bulging disc, we first need to quickly run through what discs are! If you look at a spinal cord diagram, you’ll notice it’s made up of 33 individual pieces of bone. These are vertebrae, and they’re pretty darn important since they protect the nerves of your spinal cord. Wedged between each vertebrae is a lesser-known part of your spine: discs. Spinal discs are rings made of hard fibrocartilage exterior (annulus) and jelly-like glycoprotein interior (the nucleus). They act as shock-absorbers, stopping your spinal vertebrae from knocking into one another every time you use your spine. In addition, they facilitate smooth movement in all parts of your spine. Needless to say, as part of your spine, a problem with your spinal discs can have huge impacts on your day-to-day life, including overall mobility! Bulging disc refers to situations where the hard exterior of your spinal discs are damaged or break, causing the soft jelly-like inside to ooze out. Basically, anything that damages or wears out your annulus can potentially cause a “slipped” or bulging disc. As the nucleus leaks out, it can press on surrounding nerves, causing pain, cramping numbness or weakness. It’s not just limited to the muscles in your neck and back, either – your spine is connected to every part of your body. It’s not unheard of to have spinal pain from a bulging disc radiate throughout your shoulders and arms too. Like many spinal conditions, people who perform a lot of physical labour are especially vulnerable to this type of condition, although poor posture is another contributing factor. Diagnosing your back pain: do you suffer from bulging disc? Are you sure it’s a bulging disc that’s causing your pain? How do you know? How can you find out? Bulging discs are certainly nasty, however there’s good news in that they’re often over-blamed for causing symptoms. In fact, in many cases a bulging disc can be completely asymptomatic – especially if doesn’t end up pinching any nerves. As a result, it’s entirely possible that many people are going about their day-to-day business with “slipped” discs and not even realising it. When your discs do pinch a nerve however, it’s pretty difficult to miss the tell-tale back pain! The only ways to properly identify a bulging disc is by going to a physiotherapist. Using clinical tests, we can confirm whether you’re suffering from a spinal disc injury, or any other sort of back problem. This is especially important in cases when there isn’t any immediately apparent pain! While it may sound bad, the good news is that the majority of disc problems can be resolved without surgery. And that’s where your Caulfield physiotherapist comes in! As an expert in recovering from bone and muscle conditions, your physiotherapist can prescribe routines that facilitate recovery. We focus on allowing the fibres in your annulus to heal and encouraging the fluid to return to the centre of the disc. As with any musculoskeletal problem, the first thing your physiotherapist will focus on is providing relief from your pain and protecting yourself from further complications. Your back is a part of your body that’s always in use. In addition to these treatments, your physio will also advise you on your posture to encourage healing and minimise pain. As your pain settles down, your physiotherapist will turn their attention to restoring your normal range of motion. This is where the exercise comes into the equation. Your spinal discs are brittle and sensitive as they recover. Your physio will prescribe routines that build strength in the affected parts of your back and slowly restore back function. If you’re an athlete suffering from a bulging disc, your physiotherapist will shift their attention to helping you safely ease yourself back into training and participating in your sport. That means analysing your technique and making modifications where necessary, as well as building up your core muscles. Recovery from a bulging disc is not a quick process. A thorough process is designed to deliver sustained results; this is not a quick and temporary fix. Physio AUS works with you to evaluate how you use your body. We look for any potentially risky activities and help you find ways to perform them without risking weeks of progress. Preventing recurrences is the most important part of any physiotherapist’s job. After all, one of the most common risk factors in recurring back pain is previous spinal issues. Exercise is another powerful tool when it comes to preventing recurrences. Strengthening exercises can make your spine (discs included) more resilient, reducing your odds of recurrence. Act now to secure your place in this special offer! I’ve got 5 spots left before I head overseas at the end of the month with one of my sponsored athletes who is competing, so – book before 30th June and claim $50 off your first consult! Just like any other form of back pain, bulging discs they can prove especially debilitating, and keep you off your feet for weeks at a time! Whether you’re suffering from bulging discs or any other sort of back pain, get in touch with Physio Aus’ Caulfield physiotherapist. Don’t put up with back pain any longer – call Physio AUS today on 1300 392 552 or book a consultation at our Caulfield South clinic here.